The living room of this split-level metro-area farmhouse was one of the first spaces you'd encounter when you entered the house, but the stained blue carpeting, overabundance of furniture and worn window dressings made a well-proportioned, sunny space feel dated, small and uninviting. 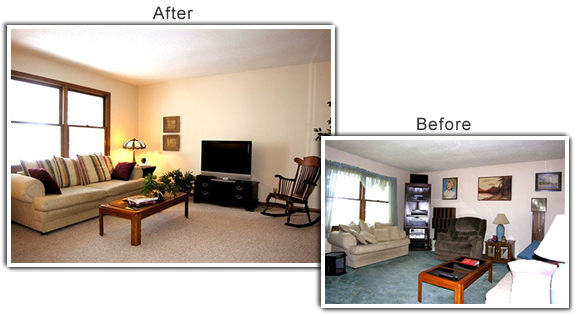 "What you noticed in this room was the carpeting and that over-sized recliner," said Lori Matzke of Centerstagehome.com. "We didn't want buyers to get hung up on the superficial negatives that completely undermined the positive features of this space." Here's what Matzke did to accentuate the positive selling points of this room. The walls were painted a creamy shade of medium ivory to warm up the space. The ceilings were painted with a mix of three parts ceiling white to one part creamy ivory paint in a flat finish. Toning down the contrast between the walls and the ceiling make the walls seem higher. The sofa was placed 8 inches in front of the windows and accessorized with oversized striped throw pillows that help focus attention on the view. Matzke put the recliner, loveseat and a few smaller pieces in storage to create more space. A taller occasional table, more proportionate to the oversized sofa, and a smaller decorative table lamp were brought in from the dining room to help illuminate a far corner of the room. Strong artwork hung too high for the low ceilings was boxed up and stored, along with the heavy table lamps and other extra items. The decorative curtains were removed and packed away. The rooms on the upper level got new ivory-colored carpet that matches carpet on the lower level, giving the house a more streamlined feel. Repositioning the stero cabinet on the wall opposite the sofa (not shown) and pairing it with a large china cabinet of similar proportions helps balandce the space and creates the illusion that the room has an entertainment center, adding to the overall funchion of the room. Small accessories on the tables, including a fern, books, and a brass sculpture, make the space look more finished. The television was centered on the main wall for easy viewing within the new arrangement. To keep the television from grabbing too much attentions, Matzke softend the look with a basket of silk greens. Neutral artwork positioned between the lamp and the television also draws the eye away from the TV. A wooden rocking chair, brought in from the dining area, provides additional seating. A tall silk ficus tree behind the chair creates a better balance between the rocker and the sofa.